โคลด ดัชเชสแห่งลอร์แรน (12 พฤศจิกายน ค.ศ. 1547 – 21 กุมภาพันธ์ ค.ศ. 1575) เสกสมรสกับชาลส์ที่ 3 ดยุกแห่งลอร์แรน. ↑ Pronounced 'medi-cease'. See also the French titles listed under 'Further reading' below. ↑ Quoted by Knecht, Catherine de’ Medici, xii. ↑ Sutherland, Ancien Régime, 20. ↑ Sutherland, for example, suggests that it was largely thanks to Catherine that Henry III was not deposed (p. 26). For contrasting summaries of Catherine’s achievement, see Nicola Sutherland’s pamphlet Catherine de Medici and the Ancien Régime (1966: 5–34), R. J. Knecht’s concluding chapter to Catherine de’ Medici (1998: 270–75), and Leonie Frieda’s concluding chapter to Catherine de Medici ( 2005 edition: 453–56). ↑ 11.0 11.1 Frieda, 35. ↑ 21.0 21.1 Frieda, 53; Knecht, Catherine de' Medici, 16. ↑ 42.0 42.1 42.2 Pettegree, 154. ↑ “This being the good pleasure of the Queen, my lady-mother, and I also approving of every opinion that she holdeth, am content and command that ....” Frieda, 146. ↑ Knecht, Catherine de' Medici, 64; Holt, 44. The incident was known later as the Amboise conspiracy]]. ↑ Frieda, 191. The rebels signed the Treaty of Hampton Court (1562) with Elizabeth I of England, giving her Le Havre (to be exchanged later for Calais), in return for her support. ↑ Frieda, 192–93. 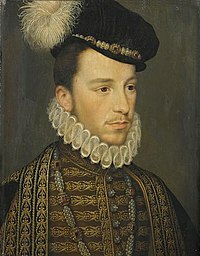 His wife, Jeanne d'Albret, remained queen regnant of Navarre; and her eight-year-old son Henry IV of France became First Prince of the Blood. * Frieda, 292. 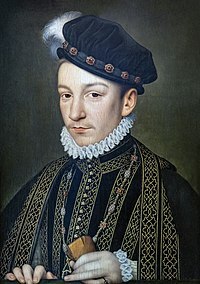 The Duke of Anjou was later reported as saying that he and Catherine had planned the assassination with Anne d'Este, who longed to avenge her husband, Duke Francis of Guise. * For an overview of historians' various interpretations, see Holt, 83–4. ↑ Holt, 84. Gaspard de Saul recalled that Catherine had summoned a war council in the Tuileries Palace (so as not to be overheard) to plan the next move: "Because the attempt on the Admiral would cause a war, she, and the rest of us, agreed that it would be advisable to bring battle in Paris". It is almost certain, however, that when Charles gave the order "Kill them all! ", he meant those drawn up on a list by Catherine, and not, as has often been claimed, all Huguenots. ↑ "The Day of the Barricades" , as the revolt became known, "reduced the authority and prestige of the monarchy to its lowest ebb for a century and a half". Morris, 260. ↑ Henry wrote a note to Villeroy, which began: "Villeroy, I remain very well contented with your service; do not fail however to go away to your house where you will stay until I send for you; do not seek the reason for this my letter, but obey me". Sutherland, Secretaries of State, 300–3. ↑ 140.0 140.1 Knecht, Catherine de' Medici, 267. ↑ 148.0 148.1 Blunt, 98. Blunt, Anthony.Art and Architecture in France: 1500–1700. New Haven, CT: Yale University Press, 1999. ISBN 0-300-07748-3. Brantôme, Pierre de Bourdeille Illustrious Dames of the Court of the Valois Kings. Translated by Katharine Prescott Wormeley. New York: Lamb, 1912. OCLC 347527. Jollet, Étienne. Jean et François Clouet. Translated by Deke Dusinberre. Paris: Lagune, 1997. ISBN 0-500-97465-9. Manetsch, Scott Michael. Theodore Beza and the Quest for Peace in France, 1572-1598. Leiden and Boston, MA : Brill Academic, 2000. ISBN 90-04-11101-8. Thomson, David. Renaissance Paris: Architecture and Growth, 1475-1600. Berkeley: University of California Press, 1984. ISBN 0-520-05347-8. Retrieved 21 March 2008. Tomas, Natalie R. The Medici Women: Gender and Power in Renaissance Florence. Aldershot, UK : Ashgate, 2003. ISBN 0-7546-0777-1. Yates, Frances.The Valois Tapestries. 1959. London: Routledge & Kegan Paul, 1999. ISBN 0-415-22043-2. หน้านี้แก้ไขล่าสุดเมื่อวันที่ 24 กุมภาพันธ์ 2562 เวลา 04:33 น.